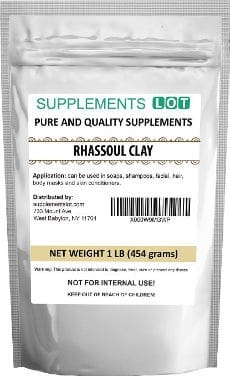 Digging into the best Rhassoul Clay Reviews is quite an interesting thing to do since Rhassoul Clay is used as a popular treatment in beauty spas both for the hair and skin because of its wonderful benefits. This clay has become so popular that many people are now seeking for the best options of Rhassoul clay to use at home, saying that this natural rich in minerals clay has become a must have product for them since it has made a big difference in their hair as well as skin care. So, before reviewing some of the top Rhassoul clay products, let’s a take a closer look at what this clay is and what it can do for your skin and hair. Rhassoul clay is a cosmetic clay that comes from beneath the Atlas Mountains in Morocco. It has been used for years by Moroccan women to successfully cleanse and detoxify their skin. Due to its rich content in iron, calcium, magnesium and potassium it removes dead skin cells, gets rid of oiliness and blackheads while at the same time it nourishes and rejuvenates the skin. Tighten and firm skin on face. Make complexion smooth, soft and toned. Is Rhassoul Clay Good for Hair? Reduces scalp dryness and flakiness. Gets rid of surface oils. Makes hair more manageable and shiny. What is a Rhassoul Clay Mask? A Rhassoul clay mask can be used on your face, body or hair. To use it as a mask, you can mix the clay with a little water to give it more of a creamy texture that will glide nicely on the skin and be applied more easily on the hair. Most of the Rhassoul clays on the market are sold in the form of powder which you have to mix with water to get a paste but there are also products that already contain some water or rose water and they are more ready to be applied on the skin or hair. Personally, I am more in favor of buying a Rhassoul clay powder and mix it with some ingredients of my personal preference than purchasing a product that is ready for use, but for some people, this may feel like a more time consuming option. After preparing the mask, apply it onto your face and allow it to dry. As it dries, it absorbs excess oils and draws impurities out of the skin. It also removes dead cells and shrinks pores. Finally, remove the mask from your skin with a wet muslin cloth or rinse it off. Now that you have some idea of what Rhassoul clay is and what it can do your skin and hair, let’s take a look at some of the best Rhassoul clay products available for your use. 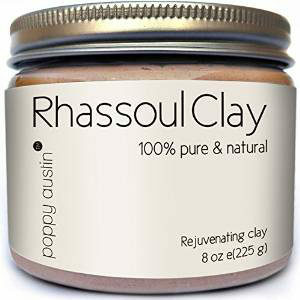 Poppy Austin Rhassoul Clay or otherwise Ghassoul Clay is a 100% pure and natural mineral richdetoxifying clay from Morocco that is totally free of synthetic additives, parabens, fragrances and alcohol. It is contained in an 8 ounce glass jar and can be used as a daily cleanser, skin conditioner, face mask and hair restoring treatment. It is actual one of the most effective natural deep pore facials and is safe even for the most dry and sensitive skin. It is also produced in small batches to ensure top quality. The product is not tested on animals and is followed by a 30 day manufacturer guarantee while it is good to know that a percentage of the sales go towards supporting the women co operatives in Morocco. According to the company, after you mix this natural Rhassoul clay with a bit of water and you apply it on your skin, you will get a feeling of gentle tightness which will be a sign that the detoxification process has started. Users are very much pleased by the effectiveness of this Ghassoul clay product, stating that they do see immediate positive results on their skin and hair. They love the fact that this is a natural product that cleanses their skin perfectly, removes blackheads, dries out blemishes, calms down acne symptoms, controls oiliness and shrinks pores. It feels light and is gentle on sensitive skin. It works great for dry skin to alleviate and moisturize it fast as well as for oily skin to control the oiliness. It does not dry out the skin but leaves it nicely moisturized. In addition, a lot of users have reported that their face looks brighter and for sure more healthy. It also tightens the skin and makes it wonderfully soft without causing any breakouts. Overall, this is a skin detoxification natural mask that is deep cleansing, soothing as well as moisturizing and makes skin glow. But Poppy Austin Rhassoul Clay is not only skin beneficial but valuable for the hair as well. After using it, people say that hair styling becomes a lot easier. They get less frizz and no tangles while both the hair and scalp feel really clean. It also softens and moisturizes the hair nicely, making curls really bouncy. The only complaint that few users had was that they would like the company to mention the exact portions of clay and water they need to use to create a clay mask. 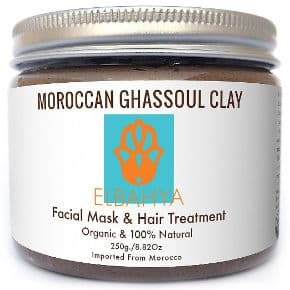 The Elbahya Ghassoul Clay comes in a 8.82 ounce jar and consists of Rhassoul clay from Morocco and rose water. It is free of harsh chemicals, synthetic ingredients and animal components. If you buy this clay, you will be offered a free Pumic Stone to remove dead skin on your feet. The difference in application between this product and the Poppy Austin clay is that you don’t need to add any water to create a paste but since it already contains rose water, it can be instantly applied to the skin or hair after opening the jar. When used on your hair, you need to massage it into your scalp, leave it in on for 15 minutes and then rinse and wash your hair while for skin use, simply apply and allow it to dry and finally rinse it off using some warm water. Users find that Elbahya Rhassoul clay mask results in a cooling feeling that softens skin and leaves their hair feeling soft and silky. It has a pleasant earthy aroma that distinctively smells like roses and a texture that is neither sticky nor grainy. Still, few people mentioned that even though it contains rose water, they needed to add a few more drops onto the clay and work it in a bit before application. Users say that they feel like getting a spa treatment for their face and hair at home, making their skin and scalp feel amazingly fresh. It sooths and softens the skin while it is great for dry scalp that tends to itch and get irritated. In addition, the jar lasts to be used for quite a few times, making this product a very good value while users are also very pleased with the free pumice stone and say that this clay makes a great gift. 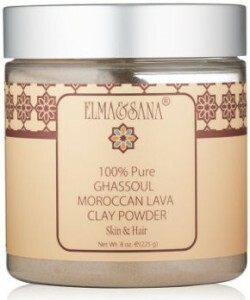 Elma and Sana Ghassoul Clay Powder is a vegan fair trade and pure natural Moroccan Rhassoul clay for skin and hair that comes in a 8 ounce plastic container. The company suggests that you should mix the clay with just the right amount of water to turn the powder into a smooth paste and supports that the powder works best if it is mixed with Moroccan rose water. Users really like this clay and state that it cleans their hair really well, leaving it more manageable and shining. It’s really gentle to the skin, a little bit of it goes a long way, and when used on the skin, it leaves it bright and calms inflammation. People find this clay product incredibly soothing to dry skin although they mention that you may want to follow this mask with some high quality Argan oil. The pores disappear, it gets rid of blackheads naturally and the scalp feels clean but not stripped off its natural oils. That makes some users be really glad to have been using it for naturally cleansing their hair, keeping away from all these chemical laden shampoos. Rhassoul Clay has a lower pH than Bentonite clay and that makes it great for not drying the skin like Bentonite Clay does. SAAQIN Rhassoul Clay comes dry in a sealed 1 pound package. You can add any number of ingredients such as rose water or coconut oil to this powder to create your own clay mask. Users say that when mixed properly, it works well to soften and clean hair, making it more manageable. When used on the skin, it results in a healthy glow and a reduction of inflammation. Most people use this clay on their hair and do state that if it is not mixed with good ingredients or if it is mixed using too much clay powder, it does tend to become gritty. In conclusion, if you need a natural treatment for your skin and hair, then our best Rhassoul clay products in this review will surely make a difference in both your skin and hair care regimen.